The front of this postcard functions as an envelope with "Souvenir de France" and "1918" on the outside flap. "Love & Kisses from Charlie" is written on the inside. 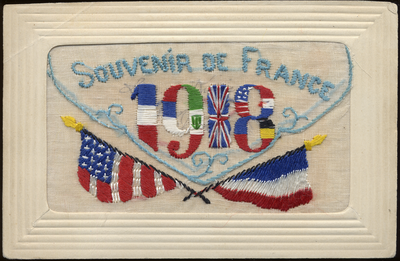 The postcard also has an embroidered American flag on the bottom left corner and an embroidered French flag on the bottom right. On reverse: handwritten message.